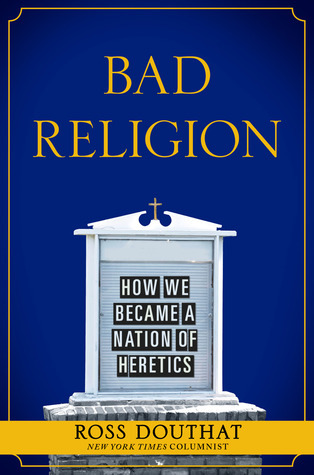 Bad Religion: How We Became a Nation of Heretics by Ross Douthat (Free Press, 2012). In the current (and seemingly eternal) political season in the United States, it can be hard to gain perspective on how we got to be such a deeply divided nation. It’s also hard to discern just how Christians should respond to the situation. Those two issues are at the heart of a book I just finished reading: Bad Religion: How We Became a Nation of Heretics, by Ross Douthat (Free Press, 2012). The author is a New York Times columnist whose opinions I often disagree with, so I began reading with some skepticism. I am happy to report that my skepticism was entirely unwarranted; on a topic that lends itself easily to polemics (it is about politics and religion after all), Douthat’s book is a model of balance, good judgment, and wide knowledge skillfully employed in the service of a clear argument. Douthat’s main point is that Christians used to have worthwhile things to say about public matters but they lost their way over the past 60 years. He describes how liberal mainline Protestant churches and post-Vatican II progressive Catholics abandoned orthodox theology and Biblical sexual ethics in an effort to remain relevant in the rapidly changing popular culture of the 1960s and 70s. Unfortunately their lack of theological distinctives did not attract broadminded newcomers to their churches as they expected; instead, liberal congregations dwindled as young people looked to other religious traditions for spiritual fulfillment and to secular sources for their progressive ideals. The demographic and theological decline of progressive Christianity meant that one of the voices needed for a healthy national debate over issues of political and personal morality was simply not up to the job. Douthat is a conservative Catholic so it did not surprise me to see him criticize liberal Christians for what he calls their accommodationist approach to cultural change. Surprisingly he argues that Evangelical Protestants and conservative Catholics who resisted changes in the culture lost their way as well. The two groups joined forces to fight what they regarded as the decline of morality in America, but before long their list of causes was indistinguishable from the platform of the Republican Party including lax environmental regulation, low taxes, and strong support for a militaristic foreign policy that had little obvious relevance to the teachings of Jesus. Adding to the woes of the Christian Right, many Evangelicals preached a fundamentalist theology that was hostile to science or spread “End Times” paranoia or endorsed a health and wealth gospel that equated material well-being with spirituality. Even worse was the revelation that for many years Catholic bishops had suppressed evidence that some of their priests were sexual predators. In the end, hypocrisy and hyper-partisanship undermined the influence of the Christian Right in national affairs. According to Douthat, failures on both sides of the ecclesiastical aisle have left America without the kind of wisdom it gained in earlier years from the likes of W. H. Auden, Reinhold Niebuhr, Martin Luther King, Jr., and Bishop Fulton Sheen — Christians who commented on matters of public policy and personal conduct using categories of thought derived from Scripture and traditional Christian theology. Since their time, “bad religion” meaning self-indulgent, theologically rootless “spirituality” of the Elizabeth Gilbert Eat, Pray, Love variety, has supplanted orthodox Christian belief and practice. The result is a society that has no way to think about its most urgent problems from a well-informed Christian perspective. He concludes with what I can only describe as an “altar call” to the reader, whatever his or her ecclesiastical or political orientation, to commit to authentic Christian belief and practice. He does not presume that such a commitment will lead individuals inevitably to one side or the other in the political debates, but he argues that authentic Christians possess wisdom and divine aid that can save them from personal and political folly while also inspiring them to care enough about the well-being of their neighbors to do what they can to promote the public good. This entry was posted in Dan Miller and tagged American politics, Bad Religion, book note, book review, Christian politics, history, Ross Douthat, US religious history. Bookmark the permalink.